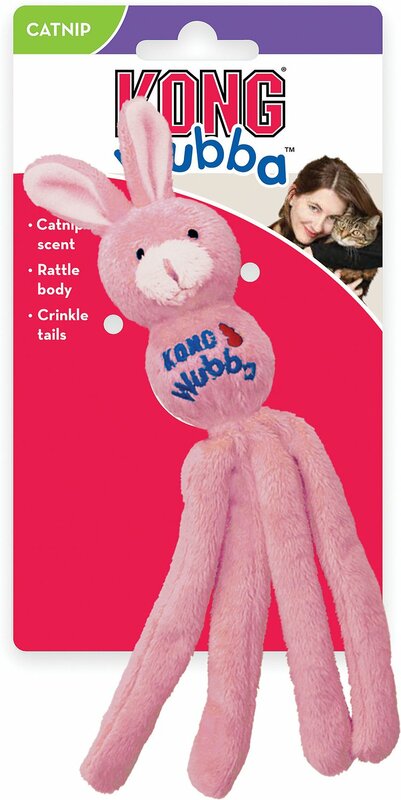 Appeal to your cat's natural hunting instincts with KONG's Wubba Bunny Cat Toy. This tempting toy is designed with long tails with a crinkle material inside and a rattle inside the top to encourage plenty of pouncing, stalking, hind-paw kicking and wrestling. It’s also infused with KONG’s premium North American catnip to excite and captivate your kitty for extended playtime fun. The ultra-soft fabric and long ears encourage plenty of supervised solo play. Long body encourages your kitty's kicking instincts. The rattling sound in the top and crinkles in the tails are designed to keep your cat engaged. Infused with KONG’s Premium North American Catnip for added excitement. Assorted colors cats love - color ships at random. Click here for refill catnip. Use a damp cloth or baby wipe to clean. My cats absolutely love this toy. It isn't their first one. Matter fact they are on their 3rd one of these. They love to pick this up and throw it into the air and chase it. Amazing how much they like this toy. I am not too pleased with this item, rather flimsy and, but for the catnip, my cat was not interested in this toy at all.